First, go to Time Tangled Island (if you are not already on it). Walk to the right, and you will see a woman in front of the lab. Now, go inside Pendelum’s Lab. Once inside, go all the way down the ramps and then go all the way to the left and push the big plug together. This will activate the Future Machine. Next, jump onto the plug, and then up again to where you see a blue light. Talk to the woman you met outside the lab, and she will give you a Mission Printout. After you receive the printout, you may read it by going to your inventory. Now, enter the blue light. You will appear in a dystopian world of either orange-brown or murky green color, with factory smoke and insects polluting the space. Go all the way to the left, where you will see an old man/woman (depending on whether your character is a boy or girl) that looks like your character. Talk to him/her, and he/she will introduce him/herself as you, but 50 years older. Ask if he/she can help you repair the past, ad he/she will give you an item which helps you travel though time – the Time Device. The time device is in your inventory now, but it can also be used by clicking on the time device icon now located at the bottom left corner of the gamescreen for easier access. You should have arrived in an icy area. You are on Mount Everest. Where you arrived, you should see that there is a place to walk on the right side. Keep following the “path” (you should easily be able to see which way you should go). After some jumping and climbing around, you should reach a dead end with a rope above you. Go up the rope. Now, you should have arrived on another icy platform. Move to the left, where you will see a man in a blue coat. Ask him why he’s stopped there, and he will tell you he lost his climbing goggles. Move to his left and you will see some small icy platforms hanging above you. Keep jumping higher until you get to the last icy platform. You should see a rope hanging above you. Go up on it. Now you are on another icy platform. Move to the left, where you will see some small icy platforms hanging above you. 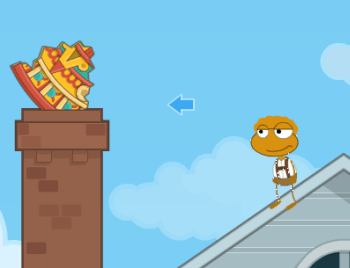 Again, keep jumping higher until you get to the last icy platform. Beware of the falling icicles! Bumping into one will knock you over, which will slow you down. After a bit of jumping, you should arrive at another platform, covered in snow. Move to the right, and take the brown Statuette of Liberty. Now, click on the time travel device. Choose the icon with a man with brown hair and a moustache (1882 AD), and press the knob! You should have arrived in a place with a lot of wood. This is the workplace where the Statue of Liberty was built. Go to the left, and enter the house marked “Gadget, Gauthier et Cie.” Go to the right and talk to the man there. Choose the third chat option to give the man the Statuette of Liberty you got in Mount Everest. (To do this, tell him, “I found your study model!”) When you give it to him, the time period (for 1882) will be repaired! Now, exit the “Gadget, Gauthier et Cie” house. Now go to the very left, where you will see a man next to a box and a barrel. Jump onto the box, then to the roof of the “Gadget, Gauthier et Cie” house. Move along the roof, and jump onto the chimney. Now jump onto the brown statue on the right. Then jump up to the wooden ledge above, then another ledge. Then jump to the left with all your might! When you’ve landed, you should have acquired a Notebook. If not, just try again until you do! Click on the time device again. This time, choose the icon of a man with a brown pigtail in his hair and is wearing a black hat (1776 AD). Move to the right, and try to avoid the hedgehogs as they will knock you over if bumped into. Soon you should arrive in front of the Graff House, a very huge red house. Jump up to the rooftop of the house (by using the window ledges). On the roof, look for the chimney with a bag of white rocks. Jump to it, and grab the Salt Rocks! Now use your Time Device and click on the woman with a pink turban on her head. Press the knob and you should be in the Mali Empire, 1387! You should be in some very brown surroundings. Move to the right until you pass by your second green bush. Above it thee should be a little ledge. Jump on it, then jump again onto the building on the left. There should be some green leaves platform above you, jump on that. Then jump to the building on the right, then to the building above the one you were just standing on. You should see a person with a white turban and blue robe there. Talk to the person and say, “I found your salt rocks!” The bag of salt rocks will be removed to your inventory (and given to that person you were talking to), and the Mali Empire’s time period will be repaired. 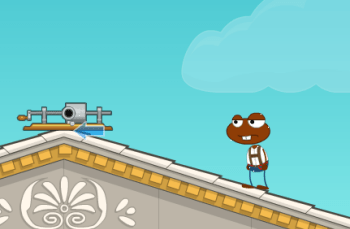 Now, jump back down to the building just below the Poptropican who you’d given the salt rocks to. There will be a snake there. Move all the way to the right, avoiding that snake (if you hit the snake, it will knock you over!). On the right you will see a small ledge above you made of little circles. Jump to that ledge, and you should see another ledge just like the one you are standing on. Jump to that one, too, and move to the right as much as possible without falling off. You should see a brown stump to your right. Jump to it, and hopefully you will land on the other side. If you don’t, then try again. If you do, continue on with the next set of directions. Make sure you are at the very bottom. If you aren’t, just jump down. 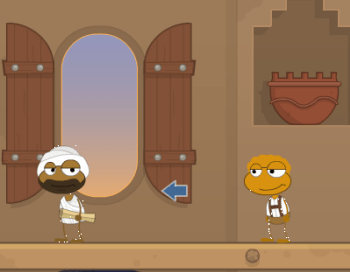 You should see a buildng called “Timbuktu Inn” with a big door with round metals on it. Go inside the door. Once inside the inn, move to the right until you see a small silver ledge. Jump on it to jump to the big brown ledge at the top. Now a jigsaw puzzle will appear in front of you. Piece the puzzle together (It’s not hard, and it only has 18 pieces!). The picture, when completed, should look like a king. When you’re done, just click anywhere on the screen. The man will give you a the Declaration of Independence. Now go back to the Graff House, 1776. Once there, move to the right, avoid the hedgehogs, and you should soon be in front of the Graff House, a big red house. Go inside. Once inside, move all the way to the right (until you can’t go any further! ), and jump onto the platform above you. There you should see a man with a black hat. He is Thomas Jefferson. Tell him, “I have the declaration!” The “Declaration of Independence” will be removed from your inventory, and will be given to Jefferson. The time period of 1776 will be repaired! Now click on the time device again. Select the icon with a man with brown hair (1877 AD). Press the knob. You should have arrived in Edison’s Workshop (check your map if you’re not sure where you are!). Go to the far left side where you sould see a vehicle which sort of looks like a bicycle. Hop onto the vehicle. Click on the circle on top of the bigger wheel, and the vehicle will move! When it’s stopped, make sure you are still on the vehicle; if not, jump on! Jump onto the branch above the vehicle, then jump to the branch above the branch you are already on. From there, hop onto the gray roof of Edison’s workshop. Run along the roof until you see a colorful piece of stone on a chimney. Jump to it, and grab it! When you’ve landed, you should have acquired a Piece of Stone. If not, just try again until you do! Open up your time device again, and choose the icon of a person wearing a leaf hat. Press the knob. You should now be in the Aztec Empire. Move to the right until you see a long set of steps. Climb all the way up until you see 2 Aztec people. 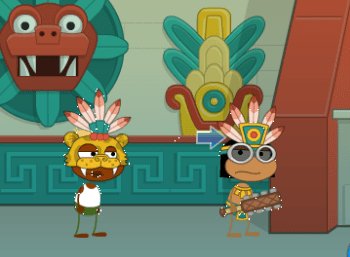 Talk to the one wearing a leaf hat like the one on the Aztecs’ icon on the time device. Tell him you have the sun stone piece, and you will give him the “Piece of Stone” you found at Edison’s workshop. The Aztec time period should be repaired. Now jump off the building with the long set of stairs and move to the right again. Stop when you have passed by a statue. Jump up to the top of the building next to the statue (not the one you jumped off of a while ago) until you see an old lady. Talk to her, and she will give you an Aztec Warrior Headdress. Put it on, then jump off the building. Open up your time device again, and go back to Mount Everest, 1953. Go back to Edmund, the man in the blue coat you met on Mount Everest. If you don’t know the way, reread the instructions in the section above labeled “Mount Everest, 1953″. Talk to Edmund and say to him, “I found your goggles!” The item “Goggles” will be transferred from your inventory to Edmund’s eyes. The time period will be repaired. Jump onto the sign, and then jump onto the big rock in front of it. From there, jump up the 3 stone ledges. On the third stone ledge, you will see some grass. Jump to the grass on the right, and keep moving right until you see another “Leo’s Workshop” sign. Above it is a rocky thing, jump on it, then move to the right where you should be walking on a wooden platform. Stop when you see a gap. Then jump to the other side of the wooden platform. You should see a man there. Above the man is a small wooden platform, jump on that, then jump on the one above it. There should be a small swing-ish ride thing near the platform. Jump onto it, and you will ride halfway down the rope. When you stop moving, jump as far as you can to the top left corner, and you should land on another wooden platform, keep moving to the left to find a stone house. Enter through the door. Once inside, move to the left and jump on the platform there. From there, move to the left again until you see a rope. Climb up the rope, and jump down to land on the machine thing. Then hop on to the platform on the right, and keep moving right until you see a man wearing brown. He is Leonardo da Vinci (Leo). Talk to him, and tell him, “I found your notebook!” The notebook you found in 1882 (Statue of Liberty) will be given to him, and will disappear from your inventory. The time period will be repaired! But as a reward, Leo will give you a Glider! You can wear this and it will help you sort of float in the air. Put on the glider, and now leave Leo’s workshop. Go back to where you found that man on one of the wooden ledges, and below him should be a silver medal, with a white glow around it to make it easier to find. 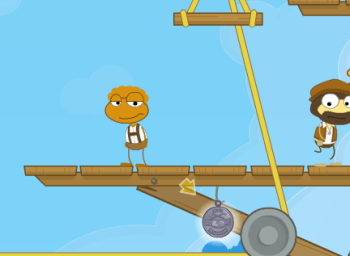 Glide over to the silver medal, and if you were successful, you should have gained a Peace Medal. If you were’t successful, keep trying until you get it! Now go back to your Time Device. Select the icon of a man wearing a brown hat and brown hair with a pigtail in it. You should now be in 1805. Move all the way to the right until you see a tree. Jump up the first tree arm, then the second, and keep going until you reach the top of the tree. 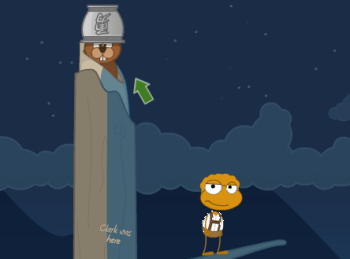 On the top, a beaver will pop up his head every few seconds with a stone bowl on his head. Reach up there and grab theStone Bowl. Go back down to the ground, and move all the way to the right until you see Captain Meriwether Lewis, the person whose face was the icon of the 1805 time period on the time device. Talk to him, and tell him, “I found the peace medal!” The time period will be repaired. Open up your time device again, and choose the icon of a person wearing a gray helmet and black moustache. Press the knob. You should now be in the Great Wall of China. Move as much as you can to the right. Pick up the barrel you see there to take the Gunpowder. Now move to the left until you see the first wooden building structure you passed by a while ago. Jump up on the first ledge, and then the second one (with a Chinese person on it). Watch out for falling bricks, because they will knock you over if you crash into them! Now jump to the other side (right side). Above you should be another wooden platform (with 2 gray bricks), jump on that. Hop on to the wide gray ledge above, and go right until you see a Chinese man wearing fine red robes. Talk to him to play a memory game. To play, just look at the tile at the top. Then below it are 8 other tiles. Look for a tile among the 8 that is identical to the one on top. Then the man will shuffle the tiles. Keep track of where the identical tile is! When he’s done shuffling, select the card out of the 8 that you think is the tile identical to the one on top. If you get it right, he will give you an Amulet. If you were wrong, you can keep trying as many times as you like to get the amulet. Also, if you’ve already gotten the amulet, you can still play the game (by talking to him again). Now move to the left, until you see another wooden structure on your left, above you. Jump to it, and move a bit more. You should see a rope. Grab hold of the rope, and then let go facing the left so that you are now standing on another wooden platform. Now move to the left, and jump off the platform (structure). Make sure you jump left. You should land on a gray wall. Move around the gray wall a bit until you see a man. Talk to him and tell him, “I have the stone bowl!” The item “Stone Bowl” will be transferred from your inventory to the Chinese man’s possesion. The time period will be repaired. Use the time device again, and this time select the icon of the Viking (man with brown double pigtailed hair, wearing silver helmet). You should be on a Viking ship. Move all the way to the right until you enter land. Talk to the first Viking (yellow shirt, silver helmet, gray hair), and tell him, “I have your amulet!” The item “Amulet” will now be owned by the Viking, and it will be removed from your inventory.Time period repaired! Now move to the right and jump onto the long stone platform with some green on it. From there, jump onto the next one, then the last long stone platform. You shoud be in front of a cave with the entrance blocked by a bunch of rocks. Click on the rocks to use your “Gunpowder” on them. The entrance will be cleared, and you will lose your gunpowder. Now, enter the cave. You’ll have about 30 seconds inside the cave to find the golden vase inside. Here’s a map of the cave and the route you should take (S for Start; F for Finish). Thanks Fierce Moon! After 30 seconds, the torch will burn out and you will have to try again if you want to get the vase. You can try as many times as you like, so don’t worry if you don’t get it the first time! (Hint: The golden vase is at the bottom of the cave. Avoid the water at the bottom. Don’t take your time because if you don’t move quickly, the torch will burn out, but don’t be too quick because you don’t want to make mistakes and go to the wrong parts of the cave!) Once you see the vase, go over to it to collect the Golden Vase. Ancient Greece (Delphi), 328 B.C. Now open up your time device, and choose the image of a soldier wearing a brown full helmet with red feathers on the top. Press the knob and you will be tranported to Ancient Greece, 328 B.C. Once there, move to the right and talk to the second soldier. 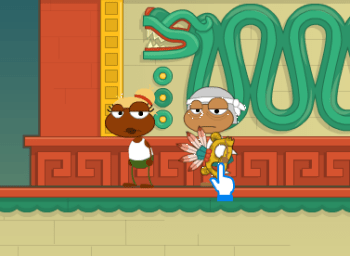 Tell him, “I have the golden vase!” The item “Golden Vase” will be removed from your inventory, and it will be placed outside of the Treasury in Ancient Greece. The Treasury is the building the two soldier guards are standing in front of. The time period will be repaired. Now move to the right until you see another man. Near him should be a vase; jump on it. From there, jump onto the white statue next to the vase you are standing on. Then jump on top of the statue, and then jump to the top left corner. You should land on the roof of the Treasury. Move around the roof, and you should see Edison’s Phonograph. Move to it to take it. From your inventory, you can click on the arrow sign on the phonograph item card to listen to Edison’s actual voice singing Mary Had a Little Lamb. Now go back to Edison’s Workshop, 1877. Once there, move along to the left, until you reach the entrance door to Edison’s workshop. Enter it. Once inside Edison’s workshop, move all the way to the left until you can’t go any further. From there, hop on to a nearby table, and then jump onto the lightbulb line on top. Next, jump up to get to the long platform above. Move around until you see a man wearing a red vest. He is Thomas Edison. Talk to him and say, “I have your phonograph!” The item “Phonograph” will be transferred from your inventory to Edison’s possesion. The time period will be repaired. You will now be in The Future! It’s a really cool place here. Have some fun exploring it! When you’re ready, follow the next set of instructions to learn how to claim your reward. Once you’re in The Future, move all the way to the right. From there, fly up to the Monorail Stop by using the blue tube that will shoot you up there. Wait for the Monorail to arrive, and then get inside. Climb up the top of the Monorail when you reach the end, and it will shoot you up to a place near where the Hovering Platform is located. If you were landed on a blue building’s platform, move to the left to find the Hovering Platform. If you were landed in a green grassy place, the Hovering Platform should be right next to you. The Hovering Platform is gray colored, and small. Hop onto it to go up. When it stops, that’s where you get off. Jump onto the grass platform on your left, move left, and enter the blue tube there. You will now be in your Sky Home! At your Sky Home, move to the right until you come to a gap. Jump over the gap, and you should be on a similar platform to the one you were standing on, except that it was on the other side. Keep moving all the way to the right, and you should see a person there. That person looks like you, except he/she has white hair and is wearing glasses. This is because that Poptropican is you, only 50 years in the future! 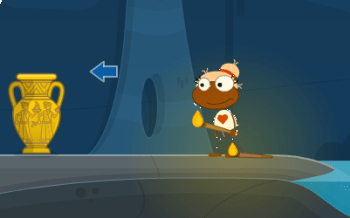 He/She will give you the quest reward, the Time Tangled island medallion and credits to spend in the Poptropica Store. Congratulations!